A Minor Inconvenience – but a major triumph! 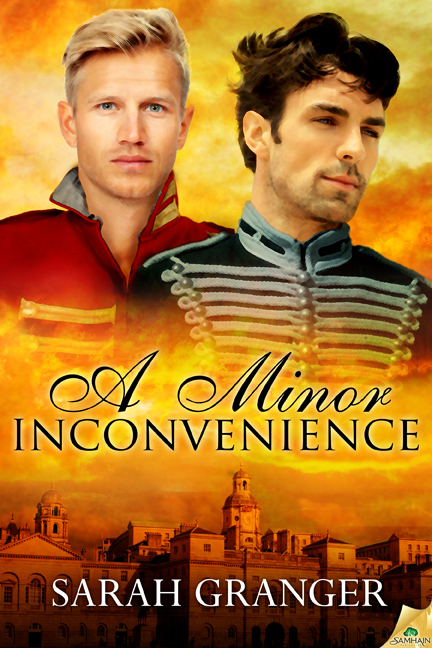 Good friend and fellow writer Sarah Granger continues her virtual book tour with the wonderful A Minor Inconvenience, a scintillating firecracker of a Regency romance that involves breeches. And more to the point, that involves the lack of breeches. That is definitely something to be commended. A Minor Inconvenience is that rare bird: an historical romance where the worldbuilding and the language are both pitch perfect; the wit is bright and the heroes charming. By the end of page one, you are in London with the hero, a London thrumming with all the excitement of the Napoleonic War. Not to mention the Season, Almacks, balls and routs. Oh, and those breeches. And the lack thereof. READ ON for an exclusive extract to whet your appetite for those items of male apparel upon which I appear to be fixated: Some hours later, Hugh was established comfortably in Theo’s sitting room, reading The Times. They had arisen rather late and enjoyed a relaxed breakfast before perusing the day’s newspapers, which had been laid out awaiting them. Apparently Theo took a copy of each of the newspapers instead of reading just one, as Hugh was wont to do. Hugh was clad in what he knew Murray would bewail as the ruins of his shirt, pantaloons and stockings from the previous night, as well as one of Theo’s dressing gowns, a magnificent creation of frogged gold-and-crimson brocaded silk. Theo, resplendent in a gown of quilted blue satin, was deep in another newspaper. Perhaps it was as well Theo was not in London often, for it was depressingly common to read that sort of thing in the newspaper. People didn’t hesitate to use military matters for political gain, regardless of whether or not they had any comprehension of those matters. “There’s no way of tracing the leak?” Hugh asked, though he thought he already knew the answer. “Next we see, they will be publishing the revised route of the Monmouth Light reinforcements,” Theo grumbled. “I no longer ride,” Hugh confessed awkwardly. And before Hugh knew entirely what he was doing, he found himself fully dressed in last night’s clothes and sent on his way to his lodgings in Ryder Street so he might shave and change into clothes suitable for riding before meeting Theo at the mews. You know, I’m not going to count the number of times I’ve used the word ‘breeches’ in this post. I think the total might appal even me. Perhaps it’s as well the excerpt ends where it does rather than in Hugh turning up in top boots and buckskin breeches, ready for his ride with Theo. One of the things I didn’t know before writing this was that, just as some daring young ladies dampened their muslins to make them cling, some gentlemen did the same with their breeches to ensure they clung to every single contour… I should make it clear that Hugh would never do such a thing, not least because it would then take Theo forever to get him out of them. I love these men so much! She’s giving *me* the vapours! I, uh, know. I’ve come over all unnecessary.